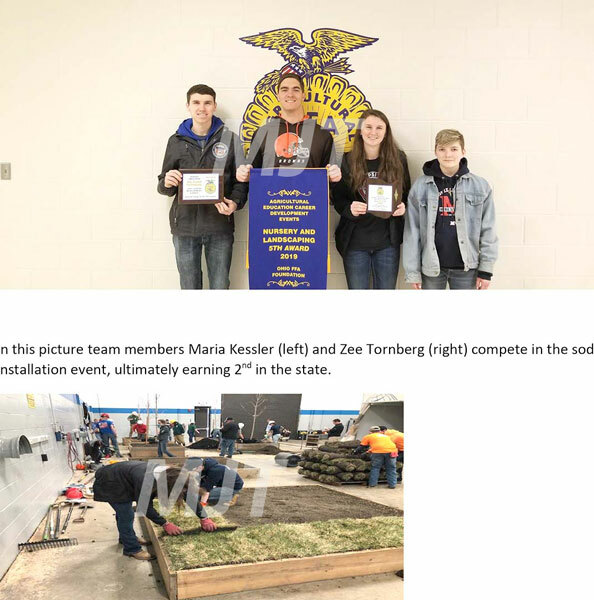 The Marysville FFA Chapter’s Nursery and Landscaping Team recently competed in the state competition. The team, made up of senior Grant Kessler, sophomores Maria Kessler and C.J. Grose and freshman Zee Tornberg, competed in individual and team events including Zero-Turn mower and mid-size commercial mower operation, irrigation repair plumbing, material estimating and blueprint reading, as well as sod installation. The team had to earn one of only 10 qualifying spots in the preliminary rounds of plant, weed, and pest ID recognition, as well as material take-off calculations. Team members Maria Kessler and Zee Tornberg placed second in the state for sod installation. Individual honors went to Maria Kessler and Grant Kessler for placing first and fifth respectively, as individuals. Kessler will be recognized at the State FFA Convention in May.